Social media marketing like Facebook, LinkedIn, Twitter and YouTube is a tricky beast. It can be time consuming and if done wrong, super spammy. That having been said, social media can produce REAL results for your small business! We do social media marketing for small business owners and oftentimes during the sales process they ask us what kind of results they can expect from our efforts. I THINK that they are asking what kind of SALES can they expect to receive within a couple of days of starting, but that is just conjecture on my part! Social media marketing is not a direct line kind of thing. It is more like grabbing a tigers tail and hoping that he is going where you want to go! I read the best post the other day about why Facebook marketing does not work, it is worth a read for sure. The nice thing about this article is that it comes from an agency who has really deep pocket clients who have made the mistakes that our small biz marketing peeps cannot afford to make. I was talking to a client the other day and he was VERY focused on growing his database so that he could send them marketing messages. With that in mind he had developed a series of four different autoresponders with GREAT content. The problem was his front-end pitching of it. Basically by reading what he was saying, you could tell immediately that his goal was to get you in his database which would turn anyone off. If you are talking A LOT with someone on social media, check out their information. Often they will have their email or phone number on there, add them to your database. Additionally, you can have a great teaser and a link that you can post judiciously that will allow people to opt into your database but don’t be a spammer about it! Here is a link to one of my clients FREE ebooks about “How To Buy USA Real Estate” that could be a good carrot! The photo shows how you can add it to your Facebook profile without looking like a spammer. 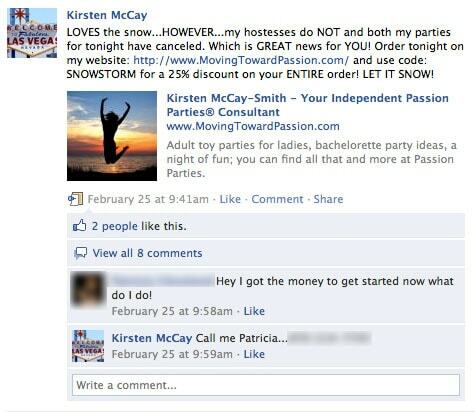 One of my favorite online MLM marketers is Kirsten McKay Smith of Passion Parties. 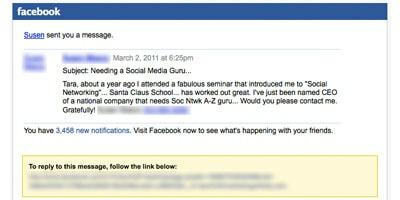 She REALLY knows how to engage her clients, team members and prospects on Facebook. THIS Is the kind of thing that can happen when you are out there. She had a prospect who she “friended” on Facebook. Now that could have gone nowhere as many of our leads do BUT through communicating on the Facebook, Kirsten stayed in touch and when her prospect was ready was there to sign her up immediately. Kirsten is also an author of the What It Takes To Make A Million Dollars In Direct Sales books, unsurprisingly, this same thing works for sales of her books. In fact, I saw on there the other day someone asking about when her forth volume was set to come out! Gotta think that will lead to some sales. The picture is a lead that I got yesterday from a prospect. The content basically said that she had met me at a talk that I gave over a year ago and had implemented some of the suggestions that I gave and had great results for her company. NOW, she is at another company and is interested in finding out about the services that I offer. YAY! So how did this happen? Was it because I set up a Facebook profile a year ago, ignored it and then magically someone wanted to buy something? Now, will she turn into a client, maybe. BUT the whole point is to fill up your pipeline with people who are curious about what you do and make sure to pay attention to them. Have to say that having them as Facebook friends is a super easy way to do that! I do not know if you know this or not, but we have a Small Business Marketing and Social Media membership site will all kinds of great information about how to actually DO some of the things that we talk about over here! In fact, I am going to be adding some new videos TODAY that cover how to do these kinds of posts that get results for your social media efforts!! !